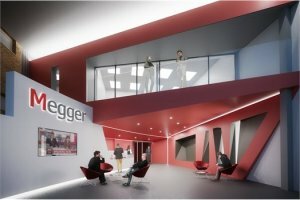 Megger is set to transform its business in Dover after full planning permission was granted for a multi-million pound investment in the company’s HQ and manufacturing plant. The plans include a new manufacturing building and access arrangements on Channel View Road, a vibrant new staff restaurant, new product development and marketing facilities, a customer training facility with specialist servicing for vehicles used for high-voltage testing, and a heritage centre with historic displays. A modern new look for the existing building on Archcliffe Road will include solar shades and a green/living wall to the existing staff car park. Megger has been based in Dover since the 1960s and employs 260 highly skilled staff in the design, development, manufacture and commercialisation of electrical testing equipment. The new investment will help the company to recruit and retain key talent as it continues to grow, creating a modern, inspirational working environment with office views out across the English Channel. Cllr Keith Morris, Leader of Dover District Council, said: "This investment is a major vote of confidence in Dover from Megger, one of the world’s premier manufacturers of electrical testing equipment. Megger has been an important part of the local economy since the 1960’s, exporting products 'Made in Dover' around the world and creating a talent pool of highly skilled local employees." Jim Fairbairn, Chief Executive, Megger Group Ltd, said: "We are delighted to announce this multi-million pound investment and couldn’t be happier with the support of the local council around our plans to make our Dover site truly world class. Everyday I’m struck by the professionalism and dedication of our staff in our Dover facility and we are thrilled as business to be able to further in invest in our site." The plans for the Megger site were developed by Clague Architects. Construction on the scheme is expected to start in the New Year.